T-Mobile has announced that ONE Plus, its premium upgrade option for T-Mobile ONE, is now available for $15 per month, rather than $25 per month as charged previously, but without unlimited tethering at up to 4G LTE speeds. For $15 per month per line, T-Mobile ONE Plus customers still get unlimited HD video streaming, unlimited international data roaming at up to 3G speeds, unlimited monthly Gogo in-flight Wi-Fi, Voicemail to Text, and Name ID call protection. A new $25 per month tier called T-Mobile ONE Plus International continues to offer those add-ons plus unlimited tethering at up to 4G LTE speeds and Stateside International Talk for unlimited calling from the U.S to landlines in 70+ countries and mobile numbers in 30+ countries, along with discounted calling to 200+ countries. The cheaper ONE Plus and new ONE Plus International upgrade options became available on Tuesday. Customers already paying $25 per month for the old ONE Plus option will be automatically upgraded to ONE Plus International, and must call or visit a T-Mobile store to switch to the cheaper $15 per month option. The base T-Mobile ONE plan itself offers unlimited talk, text, and 4G LTE data for $70 per month. A second line can be added for $50 per month, while up to six more lines can be added for an additional $20 per month each. The total cost for a family of four, for example, would be $160 per month. T-Mobile is trying to counter AT&T by offering AT&T customers a year of its rival’s own DirecTV Now streaming service if they switch to magenta. The offer has some flaws: You’ll just get a $35 monthly credit, which represents the lowest tier of DirecTV now, for one. You’ll also need to pay $120 per month (minimum) for two lines on the new T-Mobile One “unlimited” plan, which doesn’t include LTE tethering or high-definition video. John Legere’s company is also willing to match AT&T’s zero-rating by saying that streaming DirecTV Now won’t count against your data caps. By doing that, both companies are violating net neutrality rules in spirit, if not in law, by giving one service (DirecTV) an advantage over, say, Comcast (bad example, I know). Also, as mentioned, unless you pay an extra $25 per month, any video on T-Mobile is heavily compressed 480p, not HD. The offer is also a way for T-Mobile to drum up free publicity — something Legere excels at — and as I’m writing this article, it’s obviously working. However, it also offers me the opportunity to point out that in France, I have 1Gbps of internet, 161 channels and two mobile phone lines with 10GB of data each for 70 euros, or under $75 per month. So even with T-Mobile throwing in DirecTV for free, US consumers are paying a lot in comparison to the rest of the world for what has become an essential service. T-Mobile is doing its Uncarrier thing again. As the carrier works on bringing its LTE network to US forces and older cars, it’s also bringing the latest technology to its existing customers. The company’s new Digits program lets you add multiple numbers to your phone, and then use them across all your devices. Starting today, postpaid customers can sign up to try out a beta version of the service, which the company says will launch commercially next year. Those who join the trial will need to have at least Android 5.0 or iOS 9 installed on their phones, and/or Mozilla Firefox or Google Chrome on their Macs or PCs. After you register for the beta, T-Mobile’s support team will help you get started. When you sign in with your phone number, you’ll find your call history, messages and voicemail waiting for you on whichever device you logged on with. The company says the service will work on “virtually any Internet-connected device,” including feature phones, tablets, computers and wearables. Since you’ll be using the same number across your various gadgets, you won’t have to tell all your friends to add your new number to their address books. T-Mobile also says you can put multiple numbers on one device and easily switch back and forth between them. What’s interesting here is that you can also use this service on AT&T, Verizon and Sprint devices. You’ll just have to download the Digits app, and your calls will be made through your own carrier’s network. When you get a call on Digits on a non-cellular device, the connection will be made over the Internet, and your conversation will be prioritized over other data transmissions. 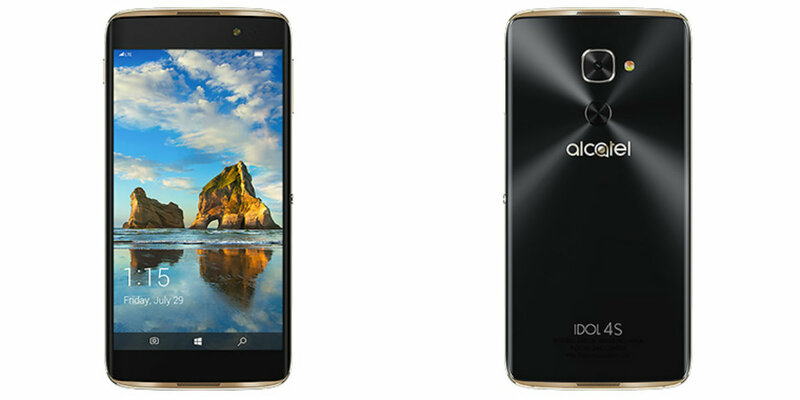 This ensures that calls “are more reliable with crystal clear HD voice quality and full mobility,” said the company. It’s not yet clear if there’s a way to prevent all your devices from ringing together at once when you get an incoming call, which would be annoying. Digits appears to be a pretty sweet way to enable more convenient communication with your phone number. Although other services, such as Apple’s iMessage and Google’s Hangouts, already let you use your phone number to send text messages from desktops, T-Mobile’s solution seems to encompass even more platforms. It could let me send SMS messages to my friends from the comfort of my laptop, regardless of their operating systems. The ability to add multiple numbers to my account also makes sense for those who have a separate line for work, removing the need to carry several phones around. Chris Velazco contributed reporting to this article. T-Mobile has announced a limited time promotion offering four lines of unlimited talk, text, and 4G LTE data for $120 per month. The deal offers new and existing customers with at least two lines an additional two more lines free, including families or individuals adding a smartphone and/or tablet to their plans. T-Mobile ONE regularly costs $70 per month for the first line, $50 per month for the second line, and $20 per month for each additional line, totaling $160 per month for a family of four. However, an existing promotion already offers the third line for free, so the new deal offers an additional $20 per month in savings. The promotion will be offered between Friday, November 18 and Sunday, November 20. A 24-month finance agreement is required. Despite President Obama’s first-term pledge to close it, the “Gitmo” Guantanamo Bay Naval Base remains open. It’s hard to believe, but the 5,500 military families and staff living there have never had cellular data coverage — until now. T-Mobile has expanded its 4G LTE coverage to the base by installing 11 new cell sites with LTE coverage. CEO John Legere says he’s “honored” to offer the service as part of the White House’s Joining Forces initiative. 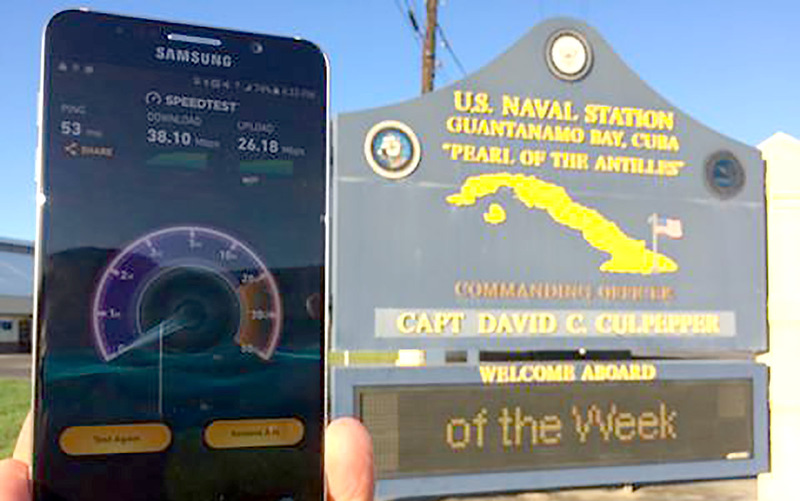 Gitmo residents get the same level of service as folks on the mainland, and a screenshot (above) shows healthy 38 Mbps upload and 26 Mbps download speeds. As of August, residents could buy postpaid and prepaid T-Mobile plans, along with smartphones and accessories, from a retail kiosk in the Navy Exchange store. In a separate arrangement, T-Mobile recently started offering cellular roaming service in Cuba. That gives vacationing magenta customers access to text, mobile and data, thanks to a deal with the government-run Empresa De Telecomunicaciones De Cuba company. Anti-drone defense systems are about to become big business. T-Mobile parent company Deutsche Telekom has confirmed to Welt am Sonntag that it’s developing an anti-drone defense system that should launch this year. It’s not discussing details, but it would be offered as a security feature for airports, stadiums and other venues where robotic flyers are unwelcome or outright dangerous. Reportedly, car manufacturers are particularly eager for Deutsche Telekom’s help — they’re annoyed by journalists (and no doubt competitors) using drones to snap photos of pre-production cars. Welt sources understand that the system (which was tested in July) involves technology from multiple companies, including US-based Dedrone. Its system can spot drones from over half a mile away using a mix of audio sensors (including ultrasound), frequency scanners and cameras. The tricky part is fending off those drones that enter forbidden airspace. You don’t have the legal authority to take down trespassing drones in Germany, so clients may have to resort to more peaceful methods like signal jamming, which forces aircraft to return home. Don’t expect to see firearms, nets or birds of prey plucking drones from the sky. If the Deutsche Telekom effort takes off, it might spur wider adoption of anti-drone systems both in Germany and abroad. A ready-made, big-name defense option could be just what companies and governments want when they’re not sure how to protect themselves against aerial invaders. It could also spur competition from security firms that see anti-drone tech as a fresh source of revenue. T-Mobile has launched the SyncUP DRIVE, an all-in-one solution for in-vehicle 4G LTE connectivity, driving analysis, vehicle tracking, and maintenance monitoring. The accessory plugs into the on-board diagnostic port, standard on most vehicles manufactured in 1996 or later. The OBD-II port is typically located underneath the driver’s side dashboard, often within close proximity of the steering wheel. It is the same port used by mechanics to diagnose vehicle and engine problems. The plug-in device can create a Wi-Fi hotspot that allows up to five devices to use 4G LTE cellular data. Meanwhile, the companion app uses GPS to track the vehicle’s location, and it can provide maintenance reminders, recall info, speed limit warnings, and car trouble notifications with Diagnostic Trouble Codes. SyncUP DRIVE is similar to the Automatic Pro, which also plugs into the OBD-II port and provides trip logging, business expensing, engine light diagnostics, fill-up logging, crash alerts, parking tracking, and more through a companion iPhone app. Automatic Pro costs $129.95 and includes unlimited 3G syncing for five years. SyncUP DRIVE will be available on November 18 for $149.99. For a limited time, customers purchasing the device on a 24-month installment plan with at least 2GB of data per month will get the accessory for free after 24 monthly bill credits. The device is not compatible with electric, hybrid, or diesel vehicles. The companion SyncUp DRIVE app for iPhone, developed by Mojio, will be available for free on the App Store. While Verizon is the only carrier to offer Google’s Pixel phones directly, T-Mobile has its own plan to tempt over Pixel owners: $325 credited towards their bill. That’s half of the cost of the $650 32GB Pixel, and a significant chunk off of the price of the $769 Pixel XL. To get the deal, you’ll need to sign up for T-Mobile’s new unlimited One plan and show a proof of purchase. Don’t expect to get the credit in one lump sum, though. The carrier says it’ll distribute it in $13.55 increments across your bill for 24 months. That’s still a good deal for anyone who plans to stick with T-Mobile, but it’s certainly not as impressive as a single bill credit. And of course, there are still some red flags with the carrier’s new One plan. It starts at $70 a month with “unlimited” data, text and talk, but you’ll have to shell out extra if you want to tether at LTE speeds or watch HD videos. Microsoft announced a major push into VR at the event today. The company is partnering with Dell, Acer, HP, ASUS and Lenovo to bring a line of $300 headsets to market. It is also revamping the venerable MS Paint program to generate 3D doodles which can be viewed in both AR and VR.